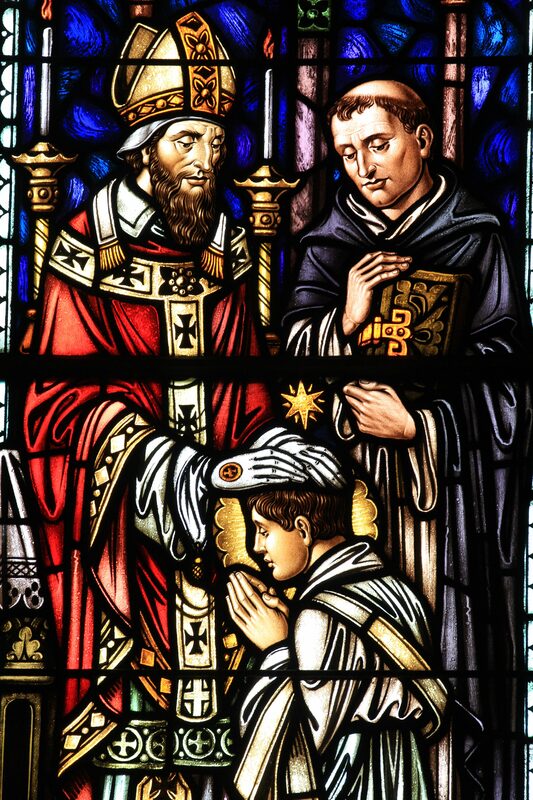 In 1194 Dominic was ordained to the priesthood, receiving the Holy Spirit to become a disciple of Christ and to go out into the world, preach the Gospel, and teach all nations. Dominic was ordained in Osma, Spain, later the center of noteworthy ecclesiastical reform by Bishop Don Martin Bazan, a zealous advocate in restoring church discipline. The ancient custom of the laying on of hands is a sign of consecration, blessing, and welcome into the ministry. By the grace of the sacrament, the priest is called to be a person of faith, giving strength and comfort in times of trial and weakness, a person of hope in times of discouragement and disappointment, and a person of prayer and compassion, bringing the love and forgiveness of God to the world. After Dominic was ordained, he mastered the art of contemplative prayer, and sharing with others the fruits of contemplation. This sharing would become a prominent attribute of Dominican spirituality.